While writing Maker with a Cause, I often likened the process to pregnancy. Month 3: Yippee! I’m so excited. “What shall we name her?” There’s so many things to pick out. Month 6-7: Trying to convince myself this WILL be worth it. Month 8: Ugh, I’ve got to go out and buy more clothes, nothing fits. Month 9: When is this going to be over!!!! Well, in honesty, I didn’t create this book on my own. There were so many encouraging family, friends and colleagues along the way. First, and most of all, my husband, Alan for whom the book is dedicated. He is the most supportive, awesome-est husband ever. He schlepped with me to Anaheim, CA to attend a service learning conference. Made me countless cups of tea – the only thing to calm me and keep me focused. And, even while a patient in the neurosurgical ICU with a cerebellar brain bleed/AVM, his first words to me were to encourage me to finish the book when my only thought was – I hope he makes it through the weekend. As a mom, I am habitually proud of my children. This past year the roles were reversed as our children, Joseph, Joshua, Jacob and Hannah, were my cheer squad. My sisters managed my husband’s office while I focused on him and finishing edits. (Hint: never trust hospital Wi-Fi.) My niece, Kelly, was my go-to proofreader. Even though she has a full-time job with a commute and a 3-year-old, she managed to find time to help me. Early on when I had no clue how to read a book contract, Heather Moorefield-Lang and Diana Rendina both came to my rescue patiently answering the most generic questions. Thank you! I am grateful for public libraries for that is where I wrote most of the book. Grateful for the peace and quiet and no eating rules. (Gained too much weight snacking at home!) And grateful for countless librarians and educators across the country who shared stories with me, kept me focused and most of all encouraged me. At work I am grateful to Heidi Stevens, our FACS teacher, who helped me with many of the sewing projects. Rita Dockswell, who reminded me I know how to crochet. Most of all, it was my principal, Mike Mosca, who let me ‘do my thing’ day in and day out. This level of support allowed me to collaborate with so many to empower our teens to make a world of difference through our MakerCare program. I hope you’ll love my new arrival as much as I do. Today therapy dogs visited our school bringing smiles and respite from a busy week filled with final exams and Regents test prep. I’ve written of my gratitude for therapy animals (yes, dogs and therapy bunny!). Animals can decrease stress in humans. However some students, like me, are allergic to animal fur. The alternatives are hypo-allergenic breeds, social robotic pets or other stress reducers. PLEASE INCLUDE YOUR FAVORITE TITLE IN THE COMMENTS BELOW! You’ll need empty water bottles with caps, Magic Beadz, a teaspoon, funnel and balloons. Pour 1 tsp of Magic Beadz into a water bottle and fill with 2 cups of water. Allow 2-3 hours for beadz to absorb water. Pour out any remaining water. Put balloon over neck of bottle and pour (squeeze, really) the beadz into the balloon. Knot off the balloon. Squeeze and Relax! Memorial Day is a day of remembrance; a day when we honor those who gave the ultimate sacrifice in service to our country. Poppies are a symbol of the sacrifice and courage of our service members. It was during World War I that Lieutenant Colonel John McCrae wrote a poem, “In Flanders Fields“, reflecting and commemorating the sacrifice and loss of life. It was Moina Belle Michael, a Georgia schoolteacher, whose perseverance convinced a nation to accept the poppy as symbol of remembrance. I love the beauty in symbolism displayed in the Missing Man Table tradition. Need a read along companion book? Try this book by Margot Theis Raven, my favorite! 2. Make some poppies with your students (or family). One example is of a poppy field after reading A Poppy is to Remember. 3. Dedicate a #POPPYINMEMORY through USAA. Or, experience a poppy field in VR while learning about the causalities of war while on the USAA site. More ideas can be found on The Compassionate Maker: Patriotism/Appreciation LibGuide. This past week scores of library professionals descended upon Phoenix. Though scheduled to attend and present, I was not among my colleagues this weekend. While transferring between healthcare facilities and advocating for my husband, I viewed numerous tweets and posts of arrivals, keynotes and conference sessions. My husband suffered a brain bleed, decompressive craniotomy and AVM resection, followed by surgery for a VP shunt. Yes, he’s a hot mess. Though not participating in person this year, I knew I was in the right place; beside my husband of thirty years. Since I was unable to attend AASL, in addition to the above titles, I have compiled a list of resources that serve as the basis for my presentations. Granted if you want the full picture, you’ll have to wait for my book, Makers with a Cause: Creative Service Projects for Library Youth (Libraries Unlimited, 2018). The evolution of our MakerCare program at Islip High School. Great go-to guide to starting a compassionate maker program. Search this site for numerous project ideas and anecdotal stories. Project ideas with instructions and images. Compassionate making along with many other creative ‘out of the box’ makerspaces. Those of you who follow this blog know about our MakerCare program. We use our school library makerspace to create items for others. We model and encourage empathic behaviors inspiring students to make a difference in their community. This is the cornerstone of our program: compassionate making. Using our makerspace to nurture compassion and empathy; to bring help to those in need. A member of our teaching staff approached me to ask how the MakerCare program worked. I explained, it’s really simple, if someone sees a need and there’s a way for us to help, we’ll do it. That’s when she shared with me her situation. Her nephew, diagnosed with cerebral palsy, was in need of bibs; could we help make some? She brought in a sample and it was a simple straight stich, two pieces of fabric sandwiched between a washcloth. We could handle that. While the library makerspace has two sewing machines available to all, I have to say many of our projects are successful due to our FACS sewing teacher, Mrs. Stevens. Her sewing class has already participated in Little Dresses for Africa and has made catnip toys for our local animal shelter. Some of her students are fast learners and find themselves with extra time, so how better to fill that time than in service to others. So, FACS students pitched in. In all, a dozen bibs were sewn and given to the family. MakerCare is flexible in that we open service opportunities to all, be it a class, club or individuals. All are invited to make a difference. We are at the end of our school year ending with service to a staff member and donations to our elementary school. It feels good to make a difference in the lives of others. I am grateful to have had the privilege to work with youth who not only care, but also are determined to be the change. As part of our MakerCare program, we use our school makerspace to create items to be donated to a variety of community agencies. In the Fall we made plarn sleep mats for the homeless. It’s a great project, but for some this may be too time consuming. We had to cut up over 500 plastic bags, then all the crocheting in order to make just one mat. Well, here’s another option for those who want to upcycle plastic bags but have limited time working with youth – plarn jump ropes. Each jump rope requires only 21-27 plastic bags and a small amount of duct tape. Additionally, you only need to cut off the handles and the bottom seams of the bags instead of the additional step of cutting the middle of the bag into strips. Really simple. *Any plastic bag can be upcycled. I also use the delivery newspaper sleeves. I do recommend cutting the sleeve in half before linking the circles, otherwise it’s very thick! However, you can experiment and see what works for you. I’ve even upcycled the dry cleaning clothes covers to make plarn. **Adjust length based on the age range of your designated youth. Longer ropes can be made as well. At Islip High School Library, we use our makerspace for service learning opportunities. Several science classes, AP Environmental and Marine Biology, are studying the effects of plastic in the ocean and on the environment in general. Here’s a great way to learn and to serve. You see, after our students make the plarn jump ropes, they will be donated to one of our elementary schools for PE class. Just think – our students learn about the environment, upcycle, and have an impact on the health and wellness of other students in their community. In December, I was notified by Library Journal that I’d been selected as a Mover & Shaker for 2017. To say I was excited is putting things mildly. Unfortunately, I had read the email notification while working on my book at my local public library. So excited I had to scoot into the stacks to avoid a scene. When that didn’t work, I packed up my laptop and headed for home. Calling my husband from the parking lot (I couldn’t wait to tell someone), I didn’t get the response I expected or hoped for. After interrupting me to shout at the TV – it was football Sunday – my husband was congratulatory but nonchalant. It’s hard to explain LJ Movers & Shakers to non-library folk. I’d have to wait for my peers. In January, I attended the LJ photoshoot at the Ritz-Carleton in Atlanta during the ALA MidWinter conference. It was a rainy Saturday, the Women’s March was on and the city was preparing for the Super Bowl. So much happening that weekend. As I entered the suite, I met some amazing librarians waiting their turn with the photographer. We introduced ourselves and chatted. I was awed by the projects and programming going on across the country. After the shoot all that was left was to await the formal announcement in March and to find out what category I was in. You see, they tell you you’re on the list but don’t tell you your category. Would I be placed with ‘Educators’ or ‘Community Builder’? I really couldn’t guess. Our inclusive MakerCare program is a community service based model teaching teens about social action and civic engagement. Using our school library makerspace, we create items to benefit agencies and organizations in need of assistance. I like to call this compassionate making. We strive to make the community and world a better place. To be the change we wish to see. Yes, that’s what we all should be when we grow up – a change agent. Every generation nurtures the next. I challenge you to be the change agent your student will become! In preparation for Random Acts of Kindness Day, students are using the MakerCare center at Islip High School to create handmade fabric hearts. MakerCare is a program within our makerspace dedicated to service projects. This month we will implement the I Found a Quilted Heart initiative in preparation of Random Acts of Kindness Day (Feb 17) and Random Acts of Kindness Week (Feb. 12-18).”The IFAQH project is simple: place hearts in a public place to be found by a random stranger. That’s it!” No special skills are needed to make the hearts. Take a look – http://www.ifoundaquiltedheart.com/the-stories/. Supplies will be left out in the library makerspace all month. Makers can create as many hearts as they wanted or make just one. Staff members were welcome to join us in making hearts. This project couldn’t be simpler or cheaper. Granted, I’ve collected a large donated collection of various fabric so I didn’t have to purchase any. And I always have scissors, needle and thread on hand. If you need fabric, take to social media and spread the word. You’ll get donations. Every crafter has scraps of fabric waiting for a project or good cause. And this project is perfect for scraps. When you’re done making your heart(s), be sure to leave in a public place for someone to find. There are some guidelines you should be aware of before placing the heart. February is the perfect month for this project for a trifecta of reasons. First, Random Acts of Kindness Day is Feb. 17. Second, Valentine’s Day is the 14th and we all know we’ll see a plethora of hearts and that may make us feel good or not so good depending on our emotional status at the time. Remember, everyone deserves love and kindness and to feel good, regardless of relationship status. The third reason February is a good month is that it coincides with our school Mid-Winter break. Our handmade hearts can be far reaching if taken on vacation with our students to be shared across the county, state, country or beyond. We’re all on this planet together right? Let’s make our communities warm, friendly happy places filled with love. So get out your fabric scraps, scissors, needle and thread and sow kindness. Because kindness matters. Let’s MAKE the world we want to live in! 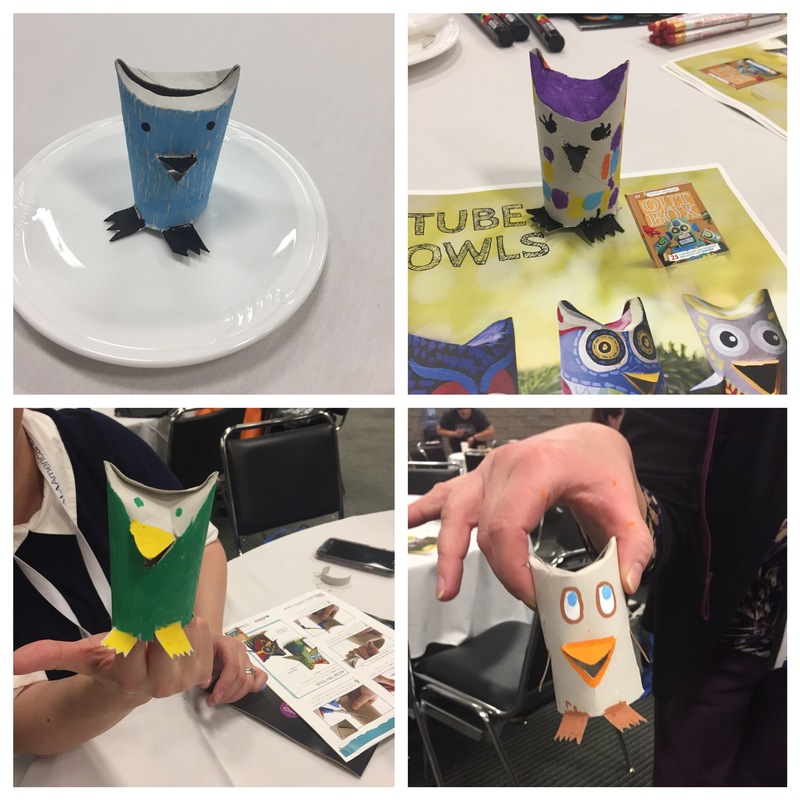 I attended a maker workshop hosted by DK this weekend at the American Library Association MidWinter conference in Atlanta. DK was promoting a soon to be published title Out of the Box, highlighting quick activities using recyclable cardboard. In a quick poll of the room participants, we were asked if our makerspaces were STEM or STEAM. There were a few show of hands for STEM, but the majority of hands raised went for STEAM designation. This was heartening because we shouldn’t be just tech based in our educational pursuits. Children are entitled and deserve a well-rounded educational experience and the Arts provide a crucial and unique layer to the development of our next generation. The librarian sitting next to me half raised her hand in response to STEAM and then stated her makerspace was STEAM plus ‘C’. My heart stopped. I had found a kindred spirit. You see, a part of our makerspace at Islip High School Library is dedicated to compassionate making. Our MakerCare program provides opportunities for our students to make a difference in the community through making. Each maker project benefits a person or community agency. For example here are a few of our projects: dog and cat toys were made for the town animal shelter, a sleep mat for the homeless, and postcards were decorated and given to sick children in the hospital. You see kindness, compassion and empathy are staple items in our makerspace. And just as, if not more, important as the other staples – glue, scissors and Legos. “Yes” she responded “C for computers or computer science.” She wasn’t quite sure which. We all stared at her for a moment until one person pointed out that computers and computer science were already a part of STEM. She knew this, but she hadn’t control of the name of the makerspace. That distinction belonged to someone else. I was disappointed a bit so I told her my mistake and shared details of our MakerCare program. I confessed I thought (and hoped) her ‘C’ stood for compassion. I announced I was “stealing” the name STEAM + C and she responded (as all librarians do) – you’re borrowing the name. That’s right, STEAM + C is officially on interlibrary loan. You see, librarians like to share and we do it well. Over the holiday break I spotted a beautiful sign and instantly thought it would make a lovely addition to our maker area. I guess we could have made our own sign, but sometimes you just find the perfect item, so why bother DIY. If it’s any consolation to my diehard makers, we did hot glue magnets to the back of the sign in order to hang it. And in true maker fashion, we failed to secure the needed size magnet and had to visit the local hardware store for thicker ones. And then a second trip to the store again as we discovered our magnetic surface wasn’t as strong as we hoped and we needed more magnets to cover the surface. Failure and grit as evidenced from one small sign – a true maker experience. Just as the Arts help complete a well rounded education, so does service to one’s community as this enables the development of civically engaged compassionate citizenry. And because nice matters.